The Micro Bit also referred to as BBC Micro Bit, stylised as micro:bit is an ARM-based embedded system designed by the BBC for use in computer education. 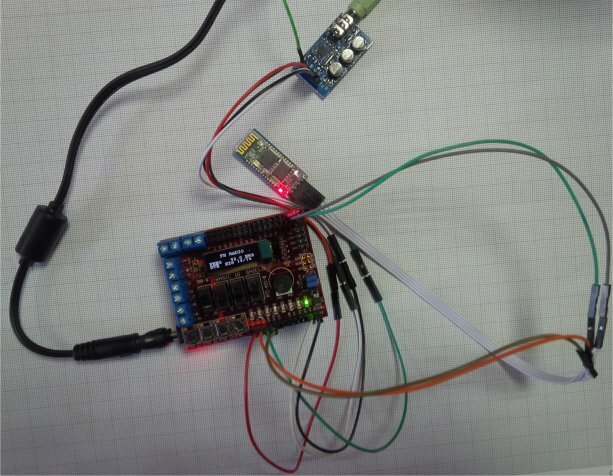 In my previous tutorial here in this blog,I showed how to read temperature with a purpose written app in App Inventor for Android phone that connects to BBC micro:bit through Bluetooth Low Energy (BLE). With an edge connector more pins can be accessed facilitating connection to other devices. Despite BBC micro:bit having hardware capable of allowing the device to work as a BLE device, it has disadvantage that only has 16k of RAM. The BLE stack alone takes up 12k RAM which means there is little room to run MicroPython and bigger codes. Scilab is a free and open-source, cross-platform numerical computational package and a high-level, numerically oriented programming language. It can be used for signal processing, statistical analysis, image enhancement, fluid dynamics simulations, numerical optimization, and modeling, simulation of explicit and implicit dynamical systems and (if the corresponding toolbox is installed) symbolic manipulations. 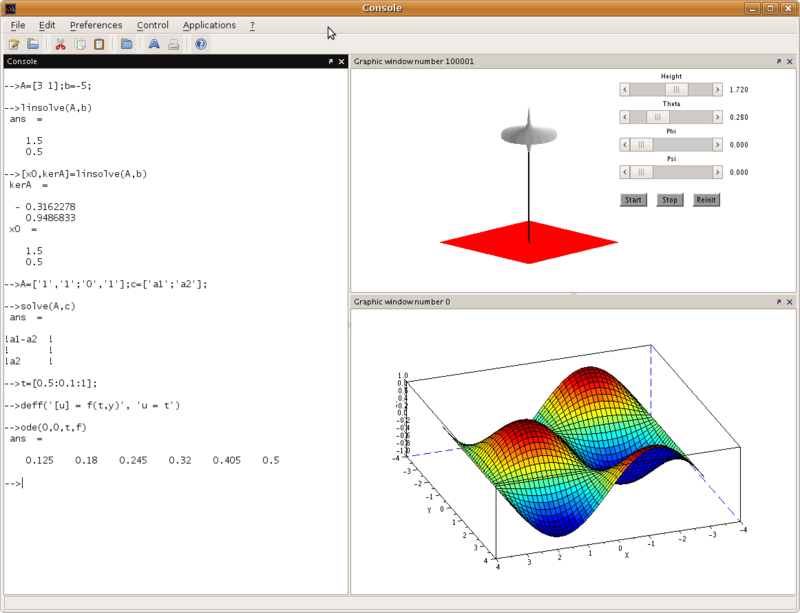 Scilab is one of the two major open-source alternatives to MATLAB, the other one being GNU Octave. Scilab puts less emphasis on syntactic compatibility with MATLAB than Octave does, but it is similar enough that some authors suggest that it is easy to transfer skills between the two systems. 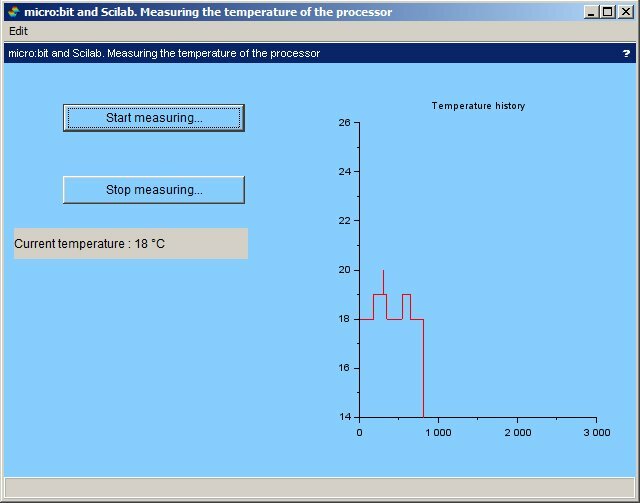 Connect BBC micro:bit to Scilab for reading anf plotting temperature of the processor on micro:bit. Write the codes, using the simplest ways, for the BBC micro:bit and Scilab, and test the setup. 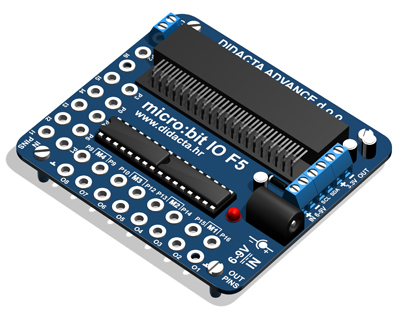 Edge-connector for BBC micro:bit: We used micro:bit IO F5 board ( 8x OUTPUT, 6x INPUT) – INPUT signal to 5V) Note that it is not needed in this project, only in next one when we will do control with Scilab. 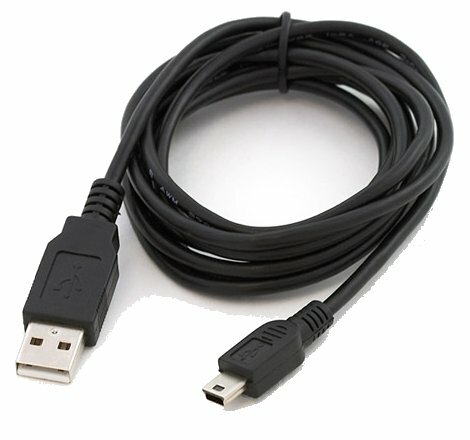 Connect the small end of the cable to your micro:bit and the other end to your computer’s USB port. Windows 10 & 8.1: Windows Update will fetch any necessary drivers. 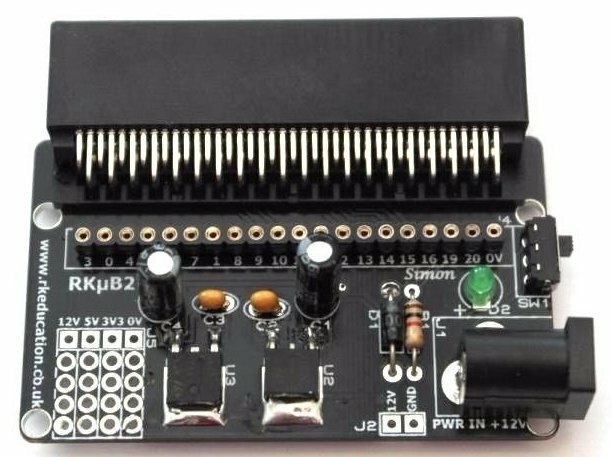 For earlier versions of Windows, (Windows 7, or Vista) if you would like to use serial communication (not necessary to program your micro:bit) you will also need the Arm MBED serial port driver. We will use Serial communication with Scilab. 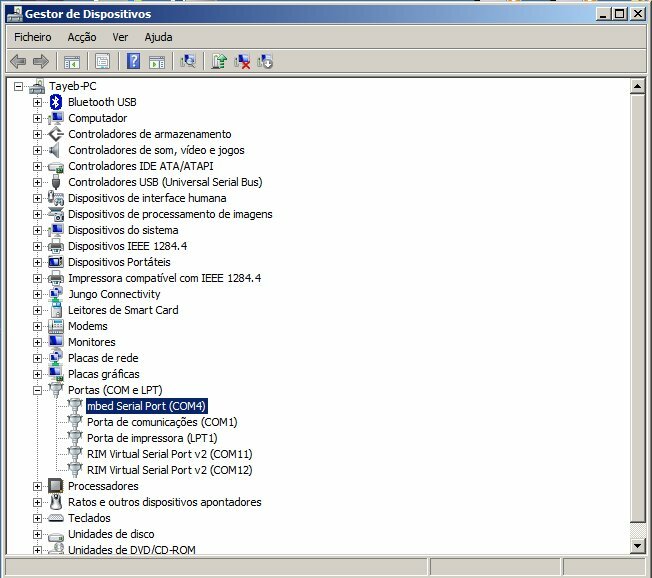 Before we can use the micro:bit serial port, we need to install a serial terminal program, and we also need to install the USB serial driver. In this tutorial, we will be using Tera Term. To get the driver, start by following the links below, then follow the installation instructions. Save the code giving it a name. And download the respective .hex file. I have also provided the hex file you can download from here. At this stage you should connect the BBC micro:bit to your PC (in my case with Windows 7 OS). The hex file once dropped or pasted (“Colar” in above image means “Paste”) will install itself in BBC micro:bit, and run. We need to verify that the BBC micro:bit is sending the temperature readings through the USB. Im our case we tested with Tera Term that is free and open source and can be installed in one’s PC with Windows. 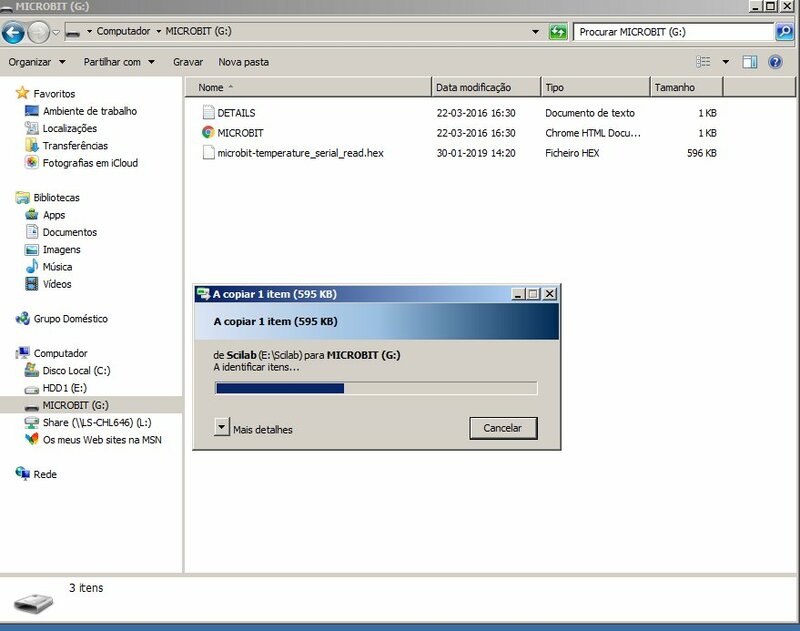 Download the Arm Mbed Windows serial port driver and install it. We need to know the port name that our PC has given to the BBC micro:bit through USB connection. In our case here it is COM4. So let us view it on Tera Term. 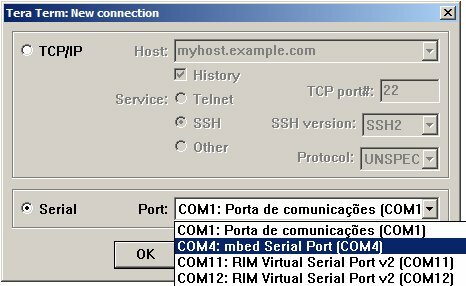 We select Serial and chose our Port (in our case COM4). The test was carried on Scilab 5.5.1 as besides being stable has many modules. The most recent version of Scilab 6.0.1 presented problems and it is unwise to use it at the moment. We will not explain how to install Scilab 5.5.1.- There are plentiful of tutorialsshowing how to do. You may need to update the database of Scilab, and to install ATOMS library. To avoid mistakes in script writing to read and plot the temperature, it is availalbe for download. The plot shows variation of temperature by blowing air with mouth, over the processor. 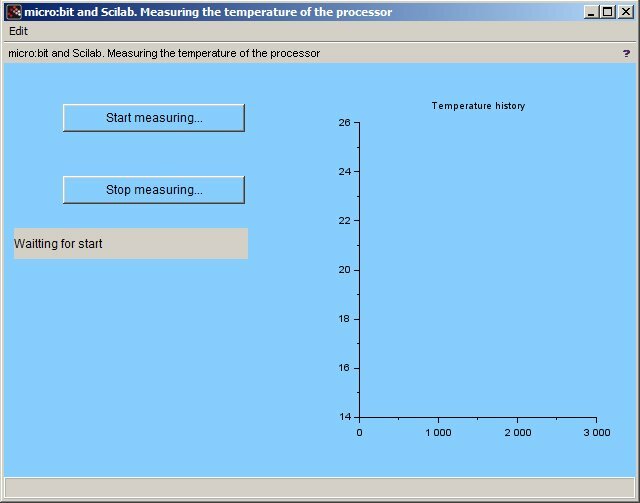 If we click onto “Stop measuring“, Scilab will stop reading the temperature and the plot will stop. 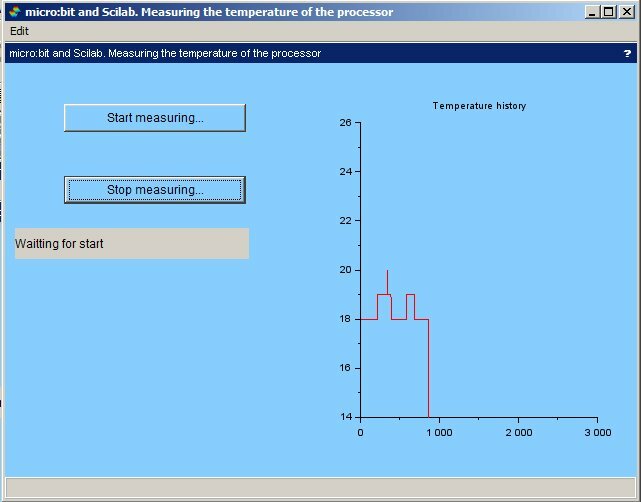 Clicking again on “Start measuring…” button, Scilab will continue reading the temperture and plotting it. Of course you can do more things with Scilab and BBC micro:bit, as we expect to do in our future post. Scilab is a powerful tool that can be used for signal processing, statistical analysis, image enhancement, fluid dynamics simulations, numerical optimization, and modeling, simulation of explicit and implicit dynamical systems and symbolic manipulations. A special thank you to Github for providing their free repository to facilitate sharing. Scilab and Microbit coding sites also have special right to acknowledgements for their free services. Also a special mention is due to Paraschos Paraschos for inspiring me towards this post. THE SOFTWARE HERE IS PROVIDED “AS IS”, WITHOUT WARRANTY OF ANY KIND, EXPRESS OR IMPLIED, INCLUDING BUT NOT LIMITED TO THE WARRANTIES OF MERCHANTABILITY, FITNESS FOR A PARTICULAR PURPOSE AND NONINFRINGEMENT. IN NO EVENT SHALL THE AUTHORS OR COPYRIGHT HOLDERS BE LIABLE FOR ANY CLAIM, DAMAGES OR OTHER LIABILITY, WHETHER IN AN ACTION OF CONTRACT, TORT OR OTHERWISE, ARISING FROM, OUT OF OR IN CONNECTION WITH THE SOFTWARE OR THE USE OR OTHER DEALINGS IN THE SOFTWARE. In my previous tutorial I showed how to read temperature with a purpose written app in App Inventor for Android phone that connects to BBC micro:bit through Bluetooth Low Energy (BLE). With an edge connector more pins can be accessed facilitating connection to other devices. Despite BBC micro:bit having hardware capable of allowing the device to work as a BLE device, it has disadvantage that only has 16k of RAM. The BLE stack alone takes up 12k RAM which means there is little room to run MicroPython and bigger codes. Build a simple BBC micro:bit Robot. Write the code, using the simplest ways, for the BBC micro:bit and Android smartphone, and test the setup. 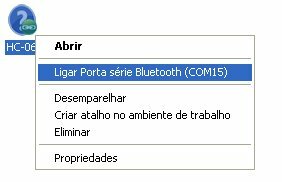 To use Bluetooth in your micro:bit application you first need to add the Bluetooth package to your project using the menu More/Add Package. 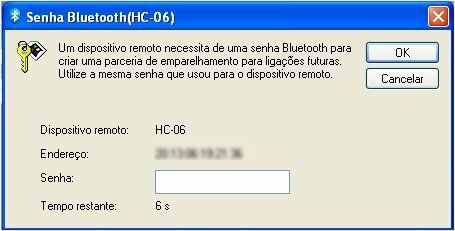 Once this is done (you may receive a warning of some incompatibilities, but do accept them) , you will have a complete collection of Bluetooth related Blocks with which can build the Bluetooth capabilities of your application. Many are very simple and merely result in a given Bluetooth service being available at run-time. 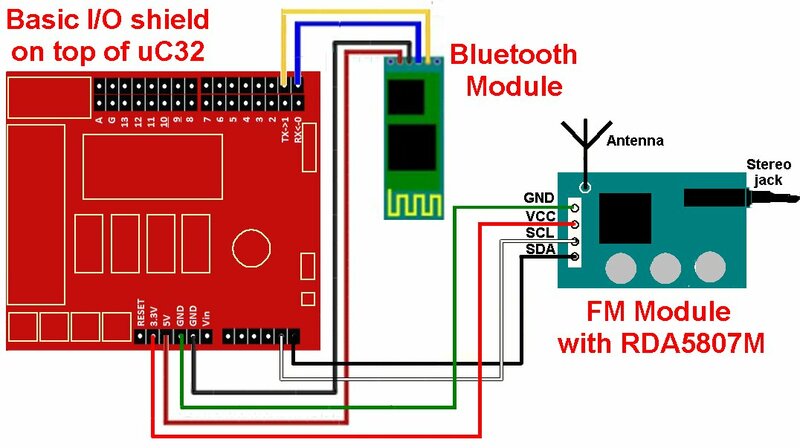 But there are also blocks which provide access to Bluetooth connect and disconnect events and the Bluetooth UART service can be used to transmit arbitrary data to a connected peer or to receive data from a peer service. NOTE: I have since written an mbed code with slight modifications to connections to BBC micro:bit. You can find the direct link here. We will write now an App for Android smartphones using visual programming. MIT has MIT App Inventor (now version 2) that we will use to write the App. MIT App Inventor is an open-source web application originally provided by Google, and now maintained by the Massachusetts Institute of Technology (MIT). MIT App Inventor and the projects on which it is based are informed by constructionist learning theories, which emphasizes that programming can be a vehicle for engaging powerful ideas through active learning. As such, it is part of an ongoing movement in computers and education that began with the work of Seymour Papert and the MIT Logo Group in the 1960s and has also manifested itself with Mitchel Resnick‘s work on Lego Mindstorms and StarLogo. MIT App Inventor is also supported with the Firebase Database extension. This allows people to store data on Google’s firebase. c) I have done all the hard work and written the whole code that you can download from here. 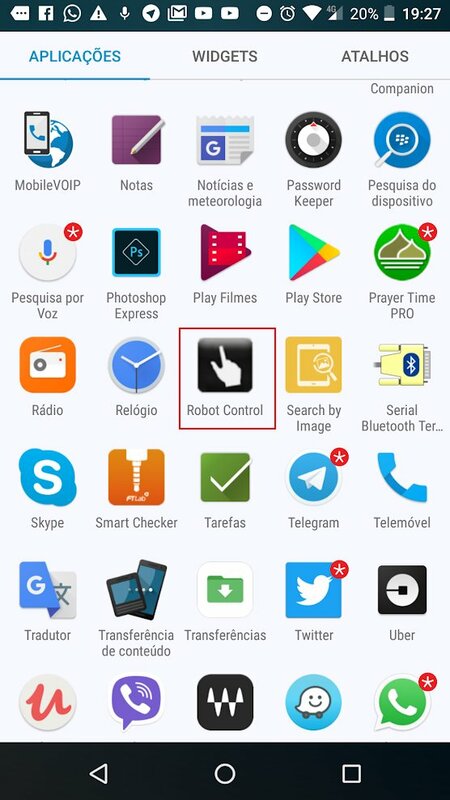 The file is named RobotControl.aia is made available at github.com repository that you can import into your MIT App Inventor account. You will, once imported, have to build and compile, and export the application with .apk extension into your Android phone, and install. You will find plenty of information in Internet on how to do it. If you are too lazy to do itor find difficult you can download the apk from here. I have Voice so every time the robot is controlled a female robotic voice is heard on the phone, courtesy of text2speech site that converts text to mp3 for us. If you have difficulties for any parts of this tutorial do not hesitate to contact me. Making your BBC micro:bit pair requires you to follow some simple steps which will be described shortly. What you do with the device you’re pairing it to will vary slightly depending on what that device is. We’ll look at how it’s done with common smartphones and tablets here too. Hold down buttons A and B on the front of your micro:bit together. The front is the side with two buttons and the LED display. Keep the two buttons held down. Don’t let go of them yet! 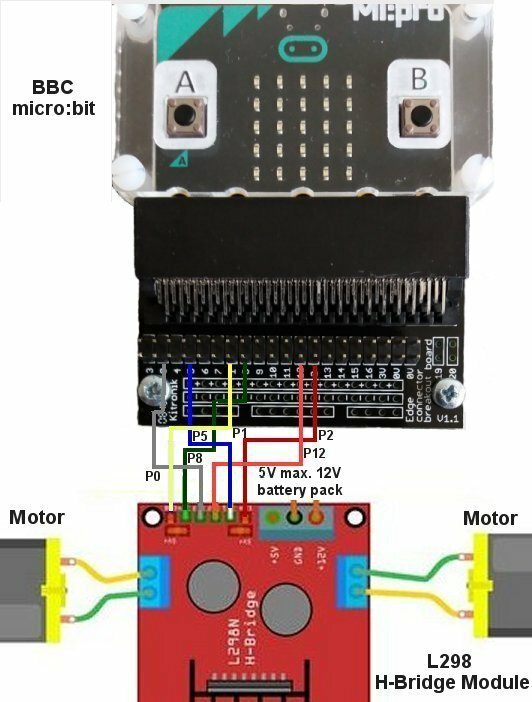 While still holding down buttons A and B, press and then release the reset button on the back of the micro:bit. Keep holding down buttons A and B. You should see “PAIRING MODE!” start to scroll across the micro:bit display. When you see this message start to appear you can release buttons A and B. Eventually you’ll see a strange pattern on your micro:bit display. This is like your micro:bit’s signature. 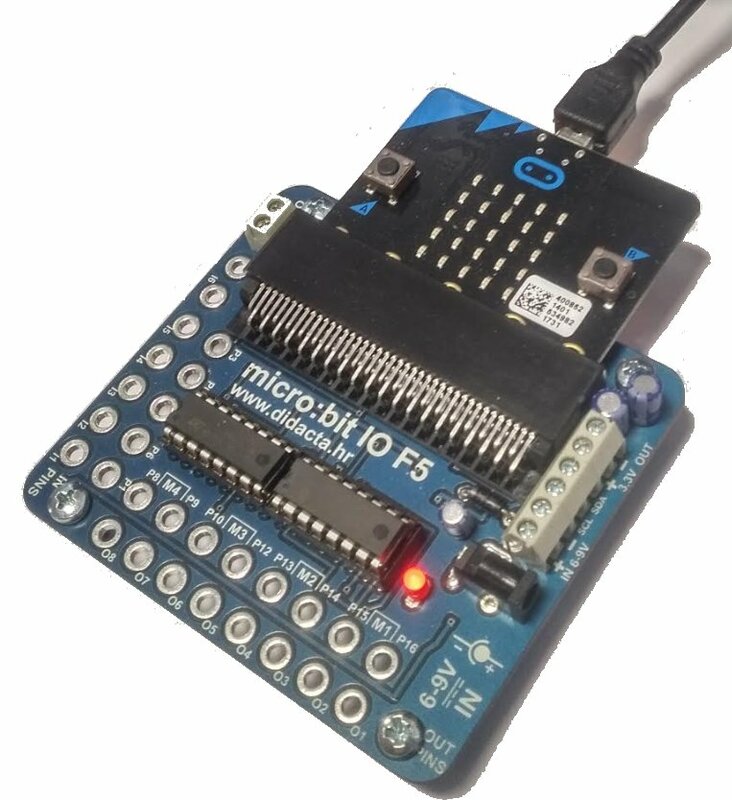 Other people’s micro:bits will probably display a different pattern. Your micro:bit is now ready to be paired with the other device. You will see the right sign on the BBC micro::bit robot and you will hear a female robotic voice in your Android phone saying “micro:bit Robot at your service!”. If Bluetooth is disconnected by pressing Disconnect button or for any other reason, the display will show X which means disconnected! With swipe gesture on the screen in UP direction you will make our Robot move forward, and the female robotic voice in your phone saying “Forward”. If your swipe on the screen is in DOWN direction that will make the robot move backward, and again you hear the female robotic voice saying “Backward”. Swipe gesture to the LEFT will turn the robot to the left, and again the voice saying “Left”, and swipe gesture to RIGHT will turn the robot to the right, and the voice saying “Right”. If you click on the Stop / Reset button it will stop the robot, and the voice will say “Stop!”. Also you will see arrows on the display of the micro:bit. If you click on Disconnect button you will hear the voice saying “Goodbye!” and communication to the Robot will be lost. Of course you can do more things with the Robot, for exmple detect obstacles and automatically make robot turn back, to avoid the obstacle and turn, etc. If you do use any parts of my tutorial, please acknowledge my work with links to this blog. A special thank you to Github for providing their free repository to facilitate sharing. MIT App Inventor and Microbit coding site also have special right to acknowledgements for their free services. Also a special mention is due to Bit:Bot Tutorial website for inspiring me with code for Bluetooth UART. I think I am the first person to share the whole project for micro:bit and writing an App for Android with App Inventor. May be I am wrong, and if I am please correct me. Taking a closer look at the front of the board, we can see the 5×5 LED array that you can use as a light sensor, a tiny screen to draw on, display words, numbers and other information, and the two programmable buttons! On the back of the board you will find the brains of the micro:bit, a 16MHz, 32-bit ARM Cortex-M0 microcontroller with 256KB Flash, 16KB RAM and a built-in temperature sensor. Additionally, the back of the micro:bit is populated by an accelerometer, compass and Bluetooth Smart antenna, as well as a microUSB and two-pin JST connector for different power options. 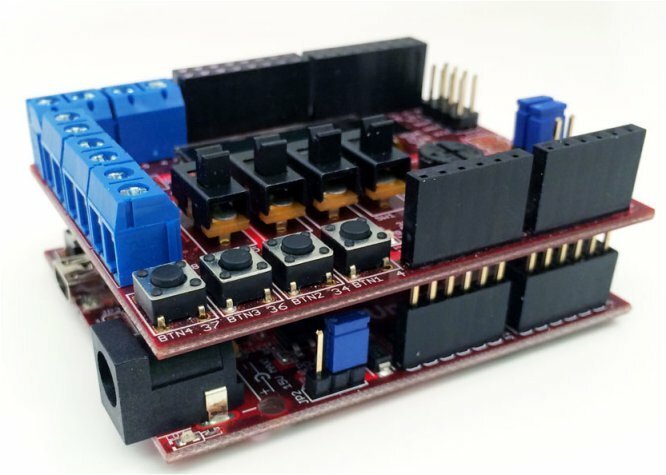 Finally, at the bottom of the board you will find 20 gold-tabbed edge pins and five ring connectors (three for digital/analog I/O, two for power and ground) for hooking up external components. The tabs with larger holes can be easily used with alligator clips to prototype added components quickly. Important: The micro:bit does not include any cables or power sources. This is just the board. We recommend picking up a micro:bit AA battery holder or a micro USB cable as well to power your board. Read temperature remotely on an Android phone with BBC micro:bit and Bluetooth Low Energy BLE. Write the codes, using the simplest ways, for the BBC micro:bit and Android smartphone, and test the setup. Duly connected BBC micro:bit through USB connector to PC and use an Android smartphone compatible with Bluetooth Low Energy BLE. Save the code giving it a name. And download the respective .hex file. At this stage you should connect the BBC micro:bit to your PC (in my case with Windows 7 OS). To stay in visual programming we will write now an App for Android smartphones. MIT has MIT App Inventor (now version 2) that we will use to write the App. If you are too lazy to write the App cyou can download the code here. The file named BLE_Temp_Mon.aia is made available at github.com repository that you can import into your MIT App Inventor account. You will, once imported, have to compile and export the application with .apk extension into your Android phone and isntall. You will find plenty of information in Internet on how to do it. Of course you can do more thinks like hearing the temperature om the Android phone writing a modification to App, and other things. Also, instead of using the ready made temperature block you can write your own one for the BBC micro:bit. If you do use any parts of my tutorial please acknowledge as I do here. A special thank you to y Martin Woolley for inspiring articles and videos on BBC micro:bit, and one of his tutorial already acknowledged above. Also a special thanks to Github for providing their free repository to facilitate sharing. MIT App Inventor and Microbit coding sites also have special right to acknowledgements for their free services. Bots are third-party applications that run inside Telegram. Users can interact with bots by sending them messages, commands and inline requests. 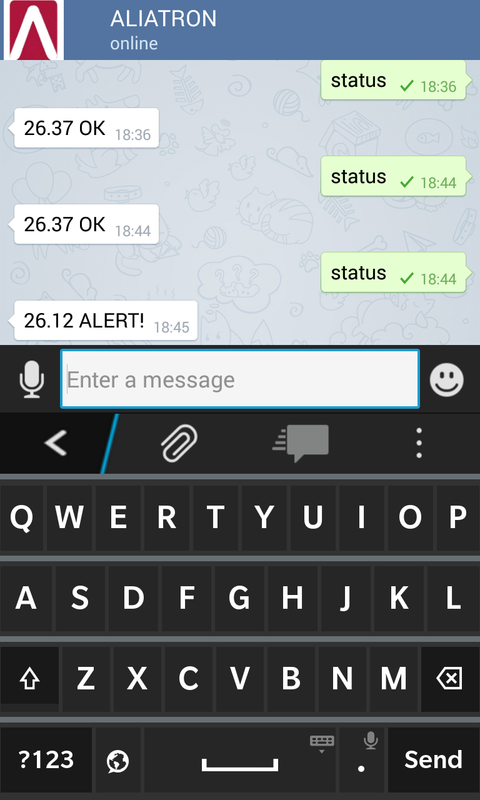 You control your bots using HTTPS requests to Telegram’s bot API. 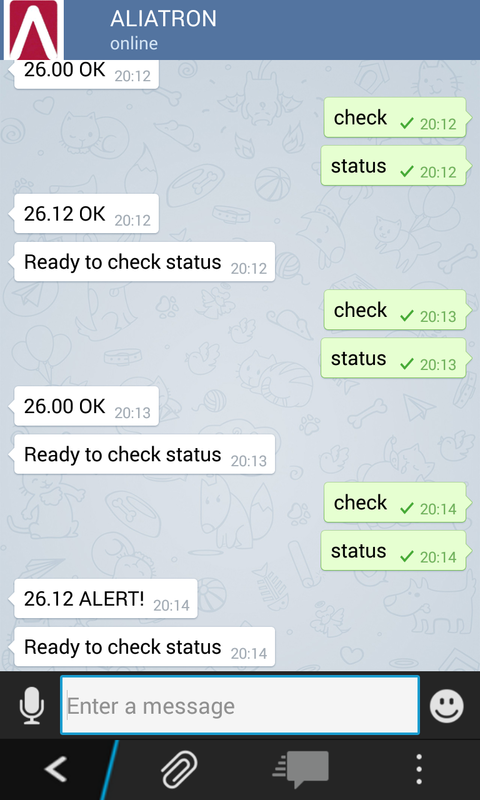 What can one do with Telegram bots? Get customized notifications and news. A bot can act as a smart newspaper, sending you relevant content as soon as it’s published. Build single- and multiplayer games. A bot can play chess and checkers against you, act as host in quiz games, or even take up the dungeon master’s dice for an RPG. Send messages and commands to bots by opening a chat with them or by adding them to groups. This is useful for chat bots or news bots like the official TechCrunch and Forbes bots. 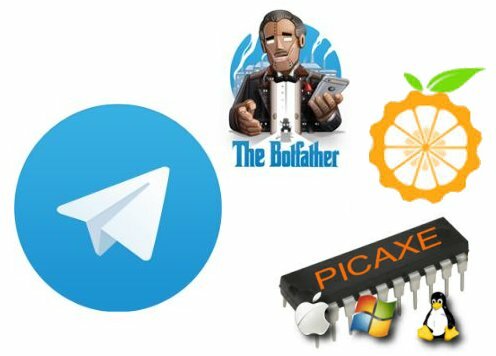 Messages, commands and requests sent by users are passed to the software running on Telegram’s servers. Their intermediary server handles all encryption and communication with the Telegram API for you. 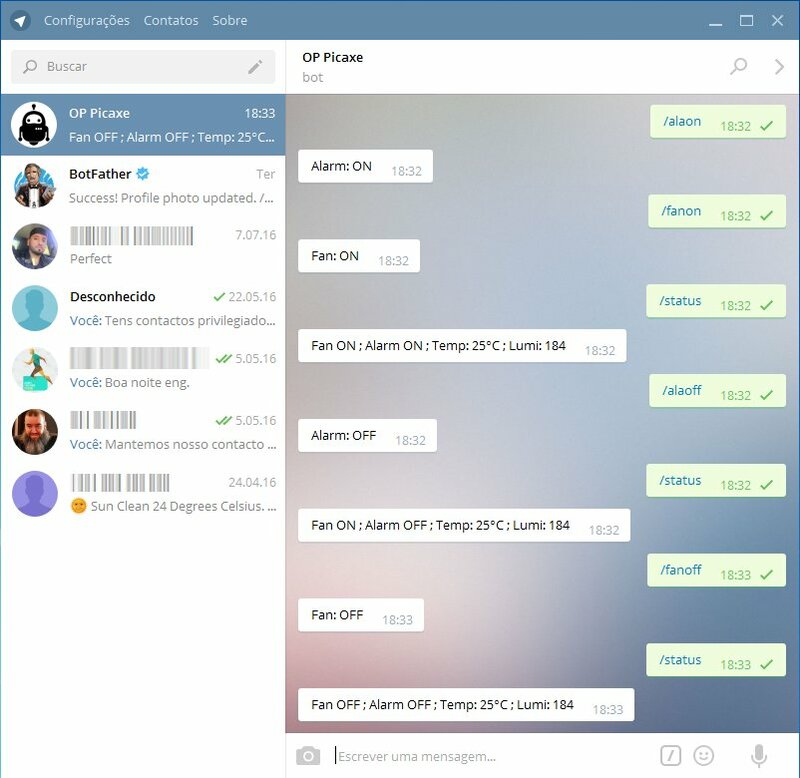 You communicate with this server via a simple HTTPS-interface that offers a simplified version of the Telegram API. 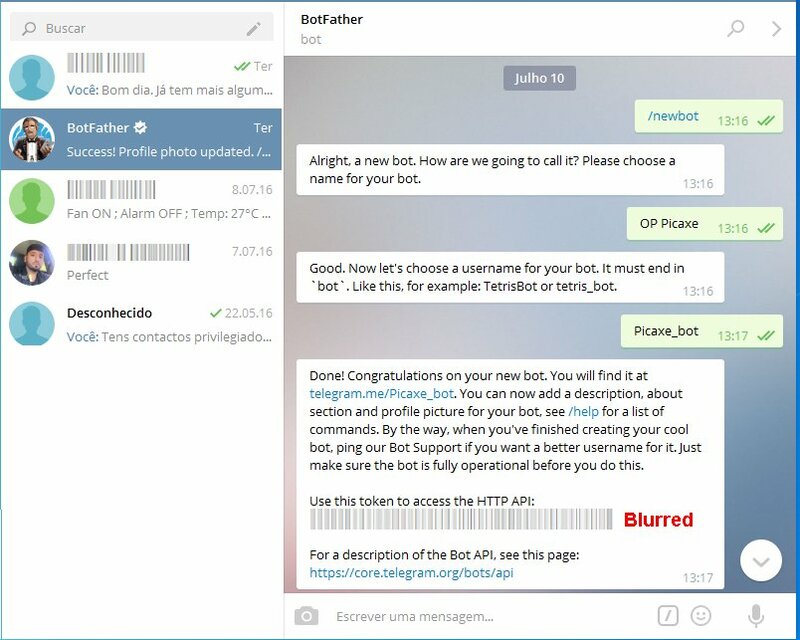 Telegram calls that interface their Bot API. How does one create a bot? There’s a… bot for that. Just talk to BotFather (described below) and follow a few simple steps. Once you’ve created a bot and received your authorization token, head down to the Bot API manual to see what you can teach your bot to do. How are bots different from humans? Bots can’t initiate conversations with users. A user must either add them to a group or send them a message first. 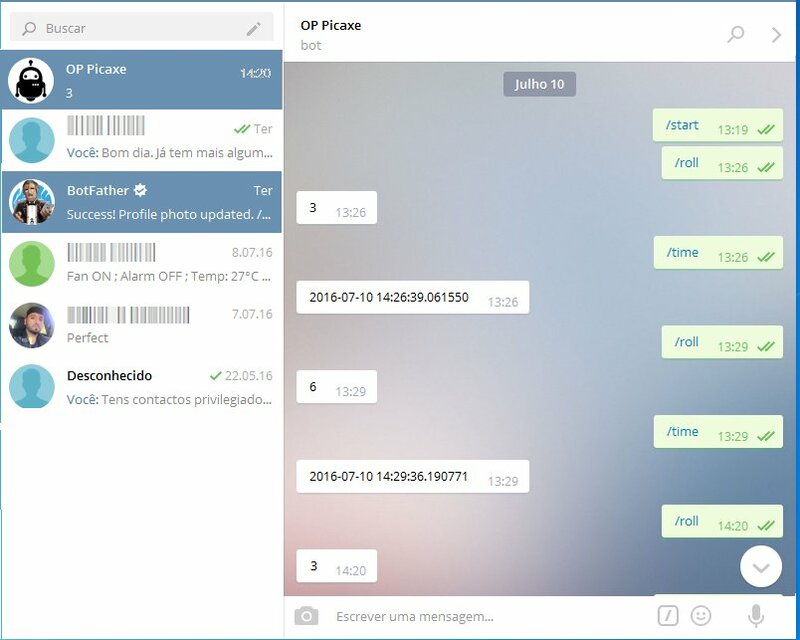 People can use telegram.me/ links or username search to find your bot. The BotFather will ask you to read a manual, but it’s not necessary! The Username is a short name, to be used in mentions and telegram.me links. Usernames are 5-32 characters long and are case insensitive, but may only include Latin characters, numbers, and underscores. Your bot’s username must end in ‘bot’, e.g. ‘tetris_bot’ or ‘TetrisBot’. 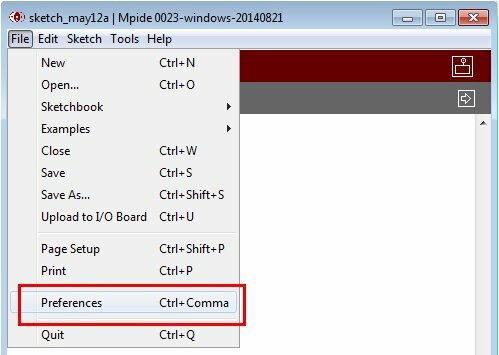 In this tutorial give an appropriate name such as ‘PicaxeBot’. The token is required to authorize the bot and send requests to the Bot API. /setname – change your bot’s name. /setdescription — changes the bot’s description, a short text of up to 512 characters, describing your bot. Users will see this text at the beginning of the conversation with the bot, titled ‘What can this bot do?’. /setabouttext — changes the bot’s about info, an even shorter text of up to 120 characters. Users will see this text on the bot’s profile page. When they share your bot with someone, this text will be sent together with the link. /setuserpic — changes the bot‘s profile pictures. It’s always nice to put a face to a name. /setcommands — changes the list of commands supported by your bot. 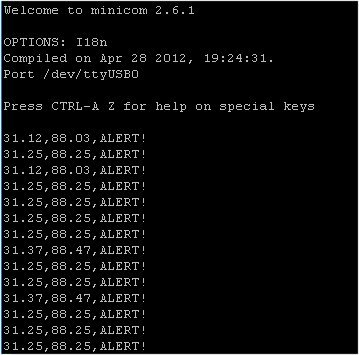 Each command has a name (must start with a slash ‘/’, alphanumeric plus underscores, no more than 32 characters, case-insensitive), parameters, and a text description. Users will see the list of commands whenever they type ‘/’ in a conversation with your bot. /setjoingroups — determines whether your bot can be added to groups or not. Any bot must be able to process private messages, but if your bot was not designed to work in groups, you can disable this. /setprivacy — determines which messages your bot will receive when added to a group. With privacy mode disabled, the bot will receive all messages. We recommend leaving privacy mode enabled. So your bot is now ready. 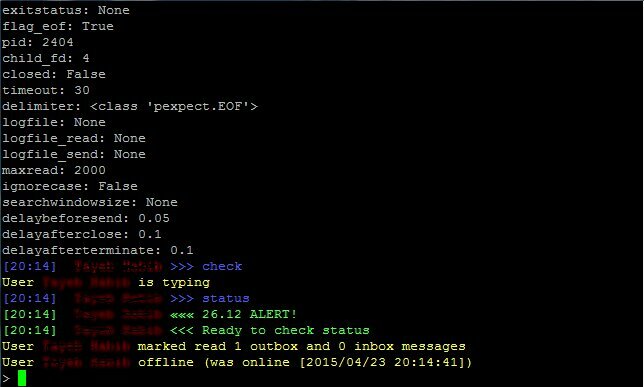 Telepot is a Python client which is the REST wrapper for Telegram API. Using it we can take commands from user and compute something and give back results to the user. 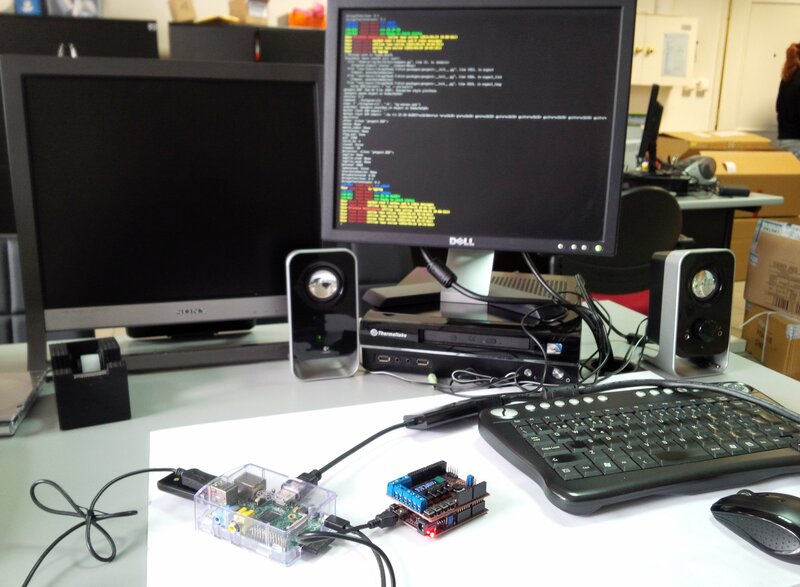 We are going to install Telepot on Orange Pi Lite (OPL) Wifi, assuming that you have OPL duly functioning with latest Armbian Jessie desktop, and with Wifi connected to your router. First we need to install the sufficient libraries for constructing the Personal Assistant. 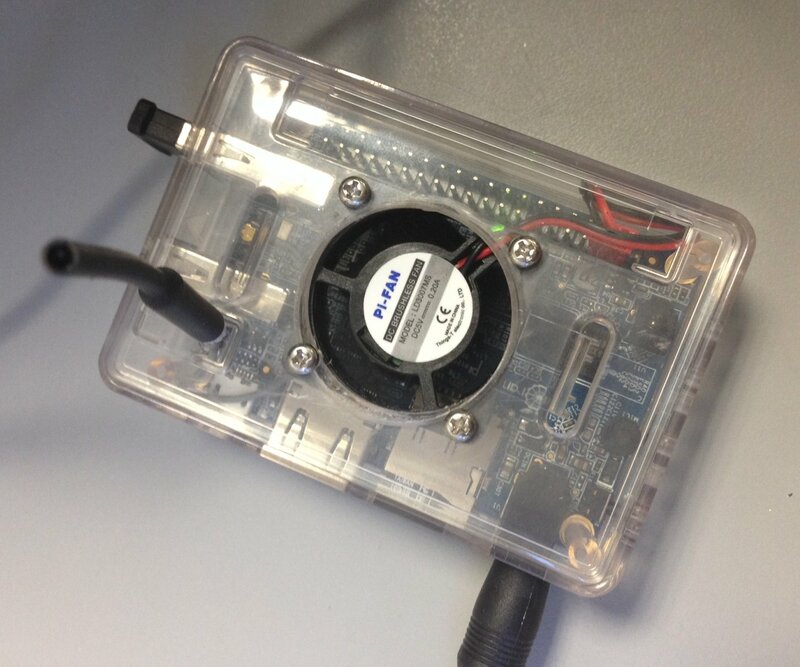 Once Telepot is installed we are ready to write our first bot code. – `/roll` – reply with a random integer between 1 and 6, like rolling a dice. – `/time` – reply with the current time, like a clock. if b0 = "a" then                 'looks for "a"
else if b0 = "c" then             'looks for "c"
We have used LogiLink USB Bluetooth V4.0 dongle but it can be any other as most seem to be recognised by Armbian’s Debian Jessie OS for Orange Pi Lite Wifi. 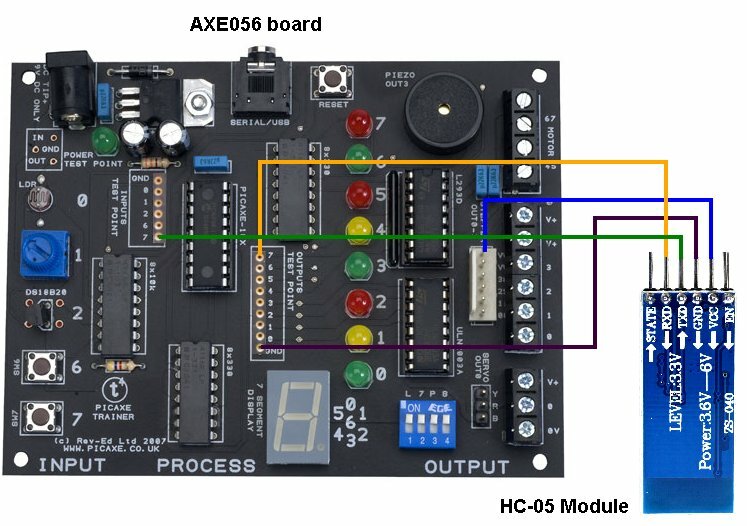 We are now to pair our dongle to HC-06 module on AXE056 board. Where xxxxxxxxxxxx is the MAC address of HC-05. AXE056 board will show LEDs 1 (yellow) and 2 (red) switching ON and OFF according to the commands you will send with Telegram. 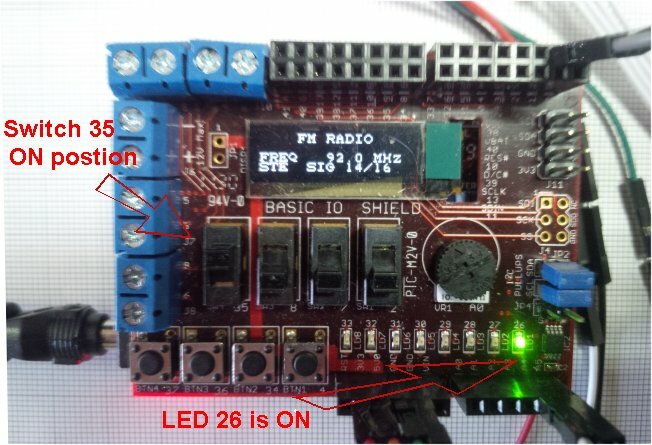 The command /status will tell the state of the LEDs, and will give you extra information on local temperature read by DS1820 and luminosity read by LDR on the same AXE056 board. 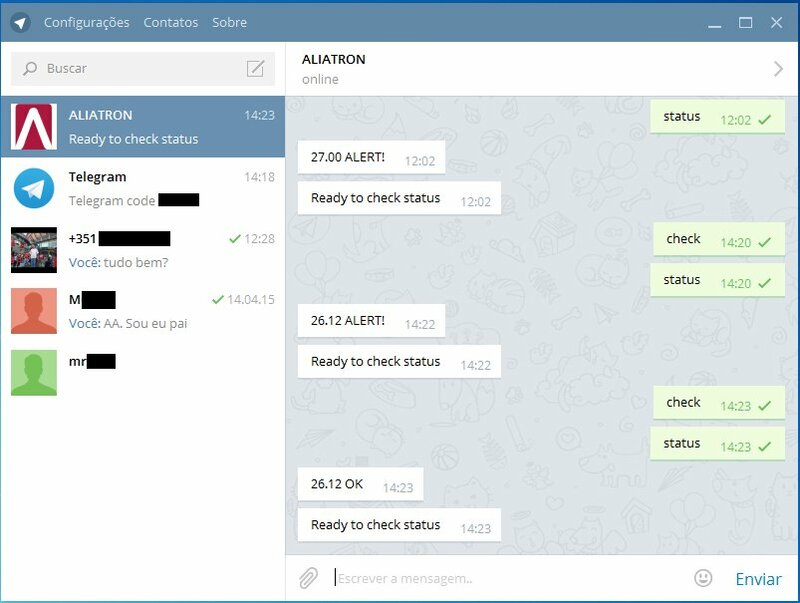 A special thank you to the Telegram Messaging team for offering us all Telegram services, and most recently the usage of Telegram Bots! 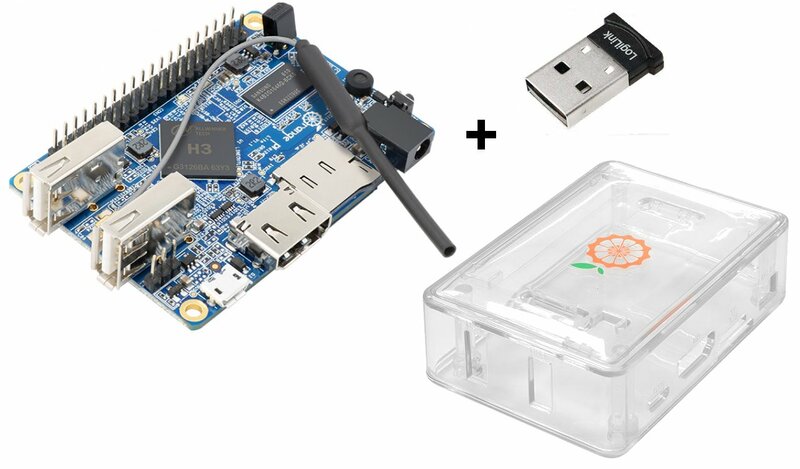 Armbian offers Debian Jessie for Orange Pi Lite Wifi. 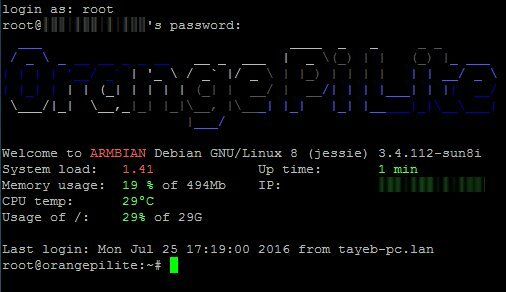 There was nothing special, and very easy, to get the Debian Jessie OS on Orange Pi Lite. As a thank you, I donated a small amount to the Armbian. I have added a heatsink and a fan to the Orange Pi Lite Wifi set up. It was heating up before to temperatures as high as 64ºC (of course in plastic box without ventilation). 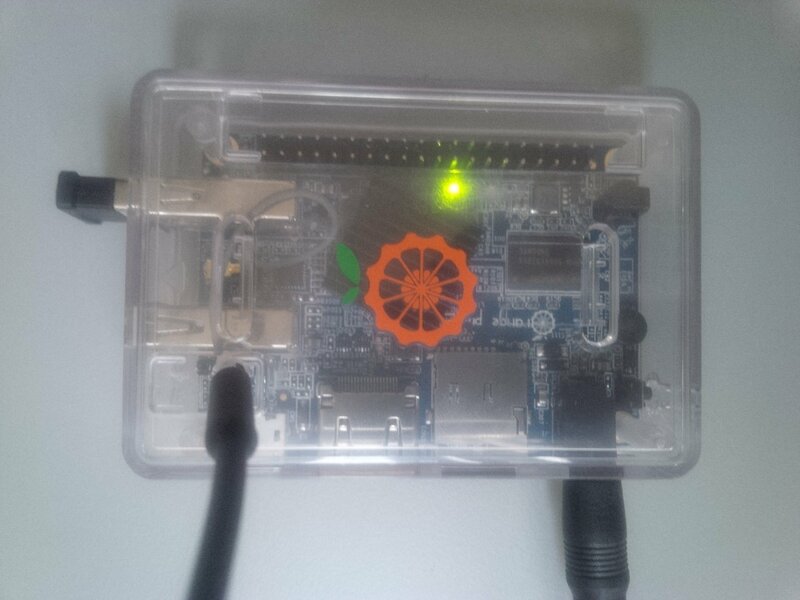 Now Orange Pi Lite Wifi works at arounf 29ºC. I know it is a bit of overkill. The following images depict what has been done. 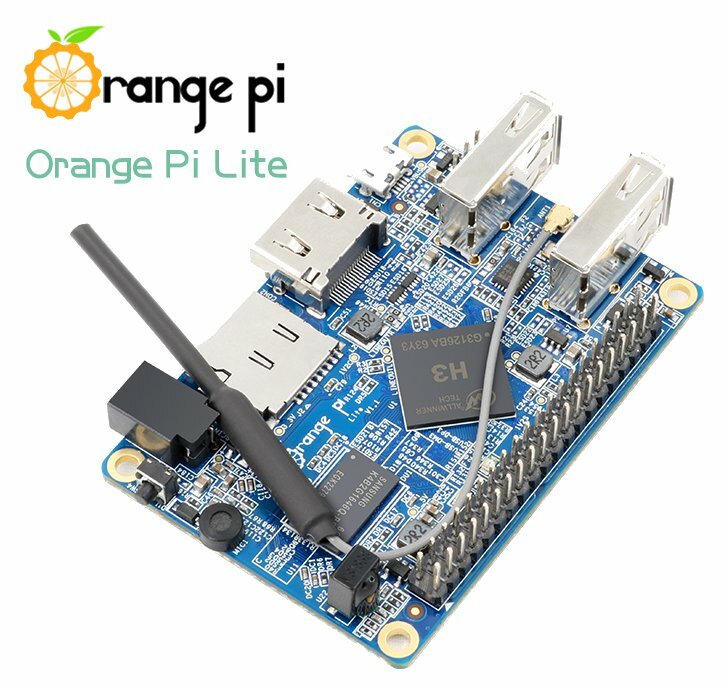 It is not necessary Orange Pi Lite Wifi to do this project. 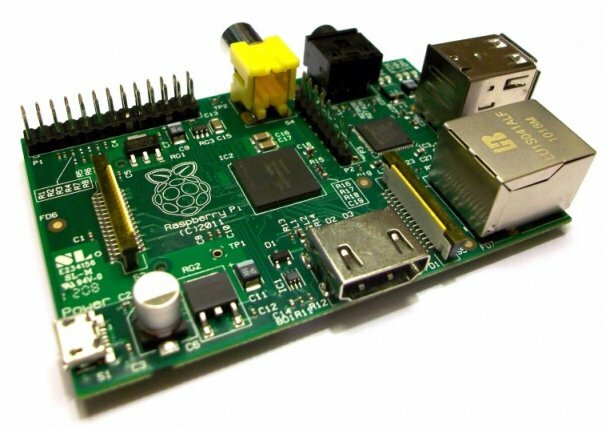 You can do it easily with Raspberry Pi, or Banana Pi. If I can be any assistance in your project with Telegram inspired on my project, please write here in comments, and I will do my best to reply. Also, if you do anything different with Telegram inspired on my work, please share links here. Also if there is anything wrong with this please let me know too. 2016 is coming, two days to go. A big thank you to all visitors and participans of this humble technical blog. The WordPress.com stats helpers prepared a 2015 annual report for this blog. Programming chipKIT, or for that matter Arduino, may be complicated for beginners. Visual Programming environments, such as of ArduBlock, can be a simple and easy solution for such beginners. 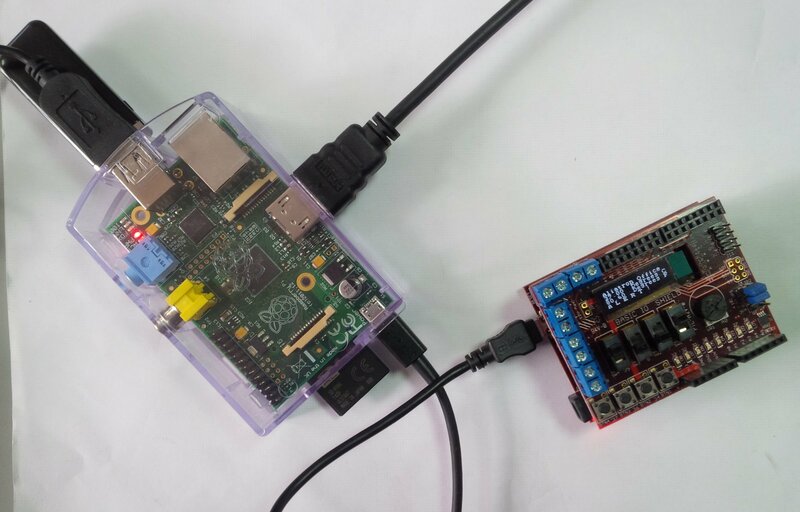 ArduBlock is a programming environment designed to make “physical computing with Arduino /chipKIT as easy as drag-and-drop.” Instead of writing code, worrying about syntax, and (mis)placing semicolons, ArduBlock allows you to visually program with an snapped-together list of code blocks. 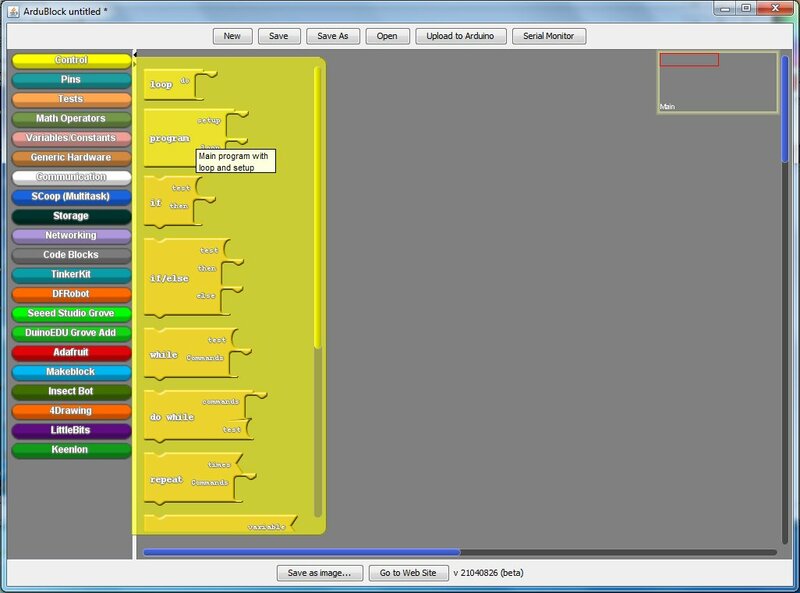 ArduBlock will work as an add-on, or more precisely a a tool, in chipKIT programming environment. It requires that you have either MPIDE or UECIDE installed. The benefit of that, though, is – because MPIDE or UECIDE are multi-platform (Windows, Mac, or Linux) ArduBlock works in all of these platforms . ArduBlock comes with no installer, just a Java file that needs to be stored in a very specific location in MPIDE. Download and Install MPIDE (if you haven’t already) – Ardublock is a tool that can be installed in MPIDE, so first of all you to have MPIDE installed on your computer. Download ArduBlock – Click the link to the left, or head over to the ArduBlock Sourceforge page to find the latest and most recent version. 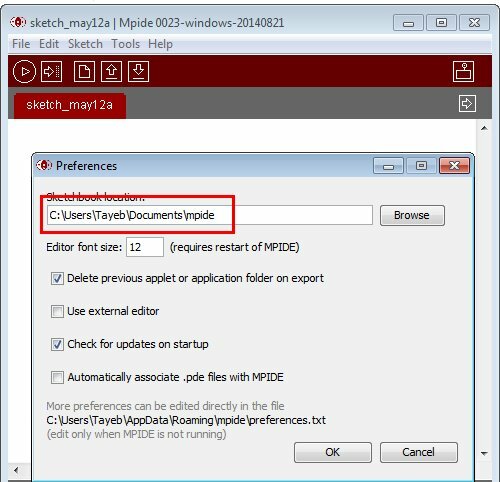 Identify your MPIDE Sketchbook location – This is a folder on your computer where your sketches and libraries are saved by default. To find your sketchbook location, run MPIDE, and go to File > Preferences. The contents of the top text box defines your sketchbook location. Memorize that location and close MPIDE. Note: each folder is case sensitive. 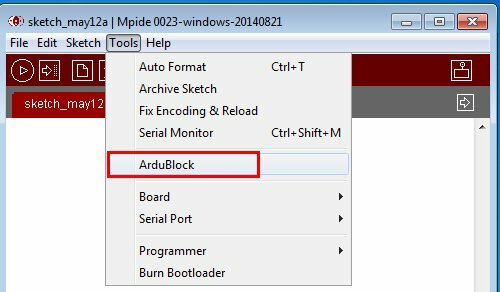 The Ardublock file you downloaded earlier needs to locted inside tool folder within MPIDE sketchbook. 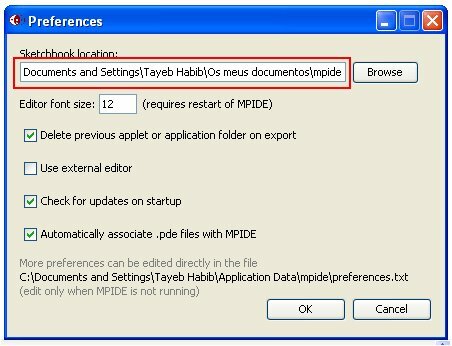 Start MPIDE – Or restart it if it was open. 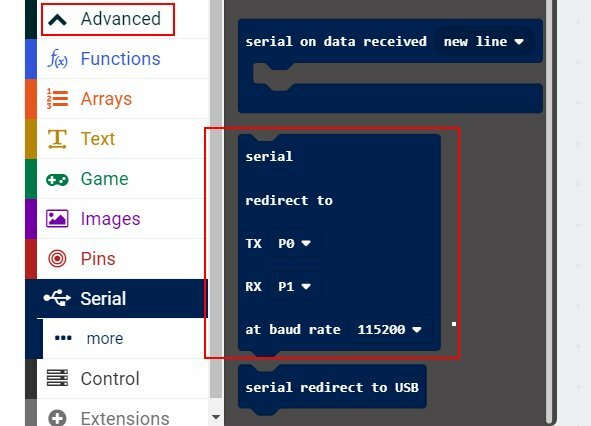 Select the Board and Serial Port: make your board (our caseuC32) and serial port selections (that you can know from Panel Control) from the “Tools” menu. 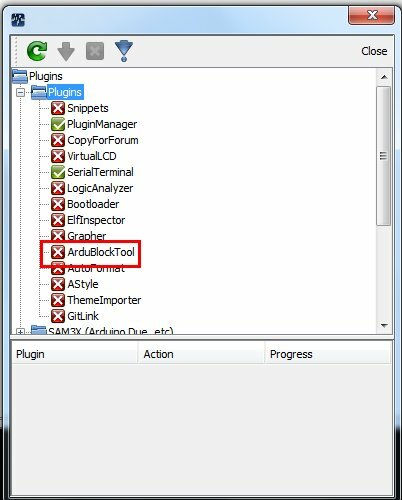 Open ArduBlock – Run ArduBlock by clicking Tools > ArduBlock. If you don’t see an entry for ArduBlock here, double-check to make sure your directories are all correctly typed and cased. 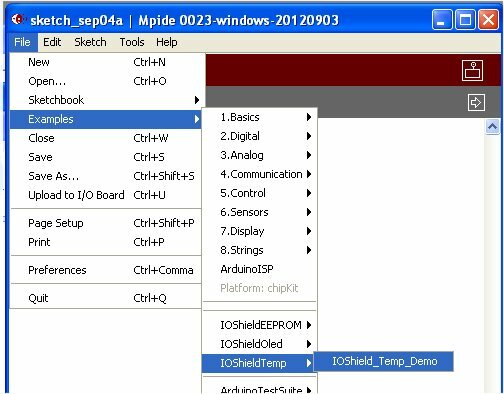 ArduBlock works together with MPIDE editor – it relies on the IDE being open in the background, so MPIDE window must remain open! Download and Install UECIDE (if you haven’t already) – Ardublock is a tool that can be installed in UECIDE, so first of all you to have UECIDE installed on your computer. Check out the tour of UECIDE. Click on the downard arrow and the ArduBlock tool plugin will be downloaded and installed automatically. Now restart UECIDE and you will see ArduBlock has been installed as a tool. You need to tell UECIDE the port at which your chipKIT board is under Hardware. So tha is it! 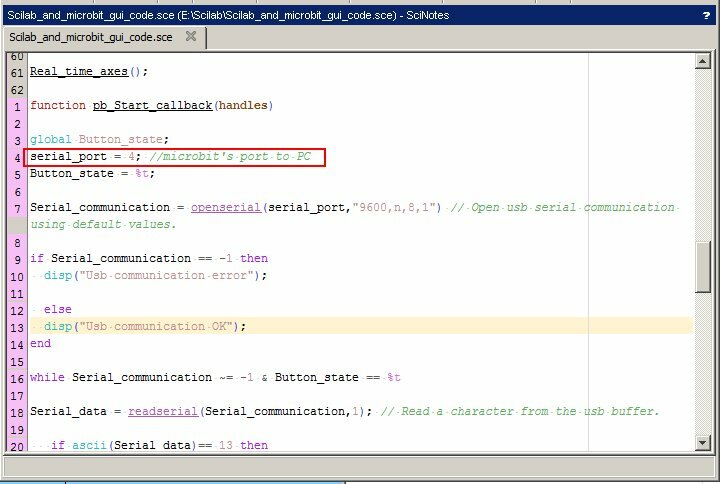 Just as with MPIDE, ArduBlock works together with UECIDE editor – it relies on the IDE being open in the background, so UECIDE window must remain open! Start ArduBlock either in MPIDE or UECIDE whichever IDE you installed. The ArduBlock window is split into two halves. The leftside of main interface contains the modules that contain blocks used for programming. 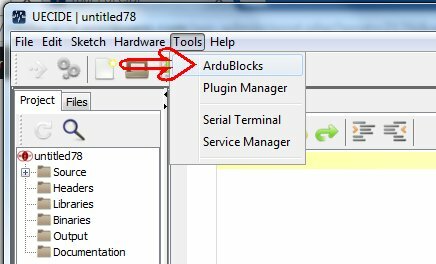 Every ArduBlock program requires a Program block, which you can find in the Control module. The Program block defines the setup and loop functions that every Arduino /chipKIT program requires. From dragging and dropping Program block, you can drag and drop more Blocks over, snapping them into either the setup or loop sections of Program block. Before you start uC32 board must be connected to your PC snd Basic I/O board installed on top of it. 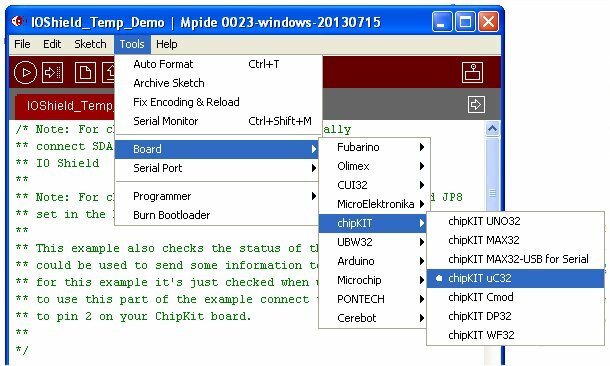 Now if you upload clicking Upload to Arduino you will see on MPIDE editor the sketch and this will be automatically uploaded to chipKIT uC32. After uC32 board resetting you will see Led 26 on Basic I/O shield blinking. All exercises contained in “Getting Started with chipKIT” book by Chuck Hellebuick have been carried out based on uC32, Basic I/O shield and the components mentioned above. 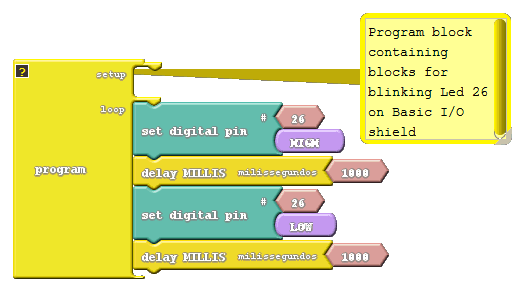 Pins have been adapted to work with Basic I/O shield. All of chapters have been tried and tested and commented. Only chapter 11 Serial Communication has not been tried and tested, but it should be also to set up. Download all the duly commented ArduBlock sketches (chap 2 to 10) kept at Bitbucket, an unlimited free private repositories’ site. 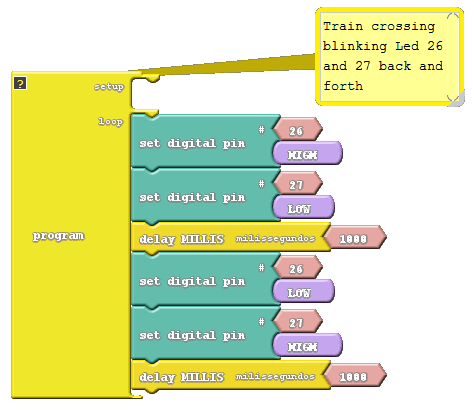 Before writing this tutorial I tried Scratch for Arduino (S4A), and other Visual Programming editors. None do seem so much functional as ArduBlock, specially because they all worked only as an interface connecting serially, or by network to Arduino / ChipKIT. 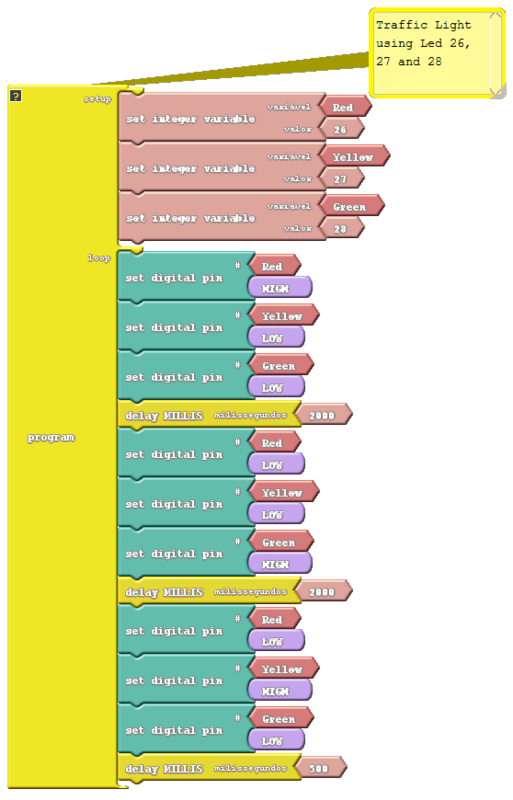 ArduBlock, and now BlocklyDuino, a new and promising Web-based visual programming editor for Arduino /chipKIT, are ideal for beginners that, after learning to program with graphical elements, can easily progress to more complex Arduino C-like programming language. The RDA5807M – an equivalent of Philips TEA5767 and pin-to-pin compatible – is a single-chip broadcast FM stereo radio tuner with fully integrated synthesizer, IF selectivity and MPX decoder. The tuner uses the CMOS process, support multi-interface and require the least external component. It is completely adjustment-free. 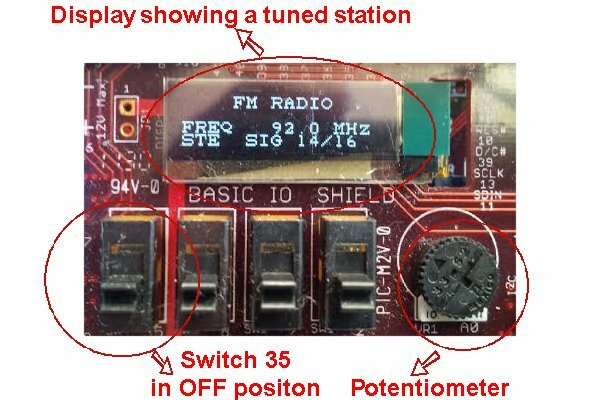 A previous tutorial published here, shows step by step how a Digilent chipKIT uC32 board and Basic I/O shield communicating in I²C protocol with the RDA5807M module can be quite a powerful, yet simple, FM Radio tuner. In the first place prepare Digilent chipKIT uC32 board for I²C communication in pins A5 and A6. On uC32 you must have Jumpers JP6 and JP8 set in the RG3 and RG2 positions. Install the Basic I/O shield on top of Uc32 as shown on the above image . Connect to the PC with USB cable. USB connection will power the Uc32 and the Basic I/O shield simultaneously. 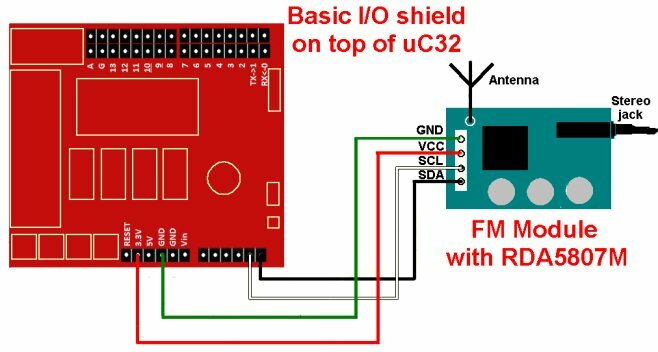 Connect the FM module to uC32 and Basic I/O shield. We will use RDA5807M in Philips TEA5767 mode. Check that your COM port. In my case it is COM30. If all is well you can now tune FM Radio stations. You can download the project from here, that s being kept at BitBucket a free and unlimited repository for private usage. 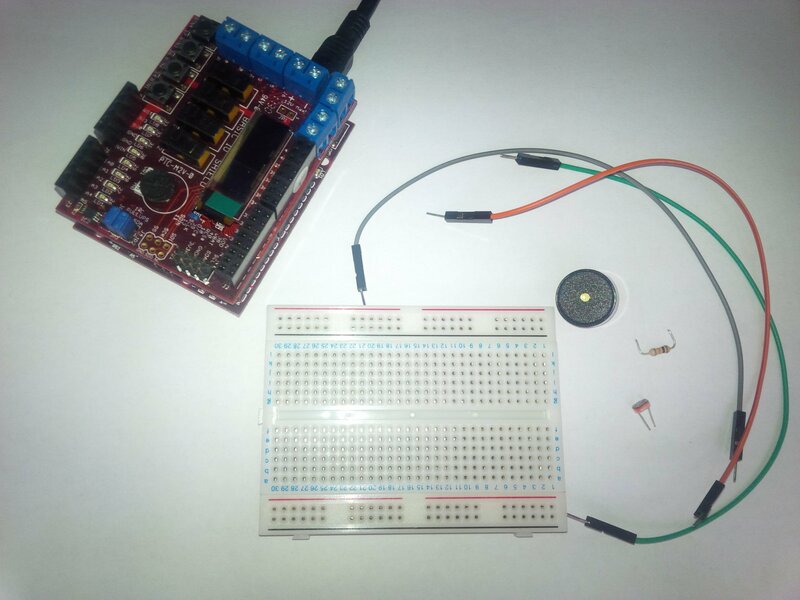 The LED on JY-MCU will stop blinking and will be ON continuously. Now Run the ProfiLab-Expert 4.0 project clicking the Start button or by clicking F9 button of your keyboard. First connect external power supply to set up consisting of the Digilent chipKIT uC32 board and Basic I/O shield. The interesting feature of the ProfiLab-Expert 4.0 project is that the Panel remembers the last tuned station. 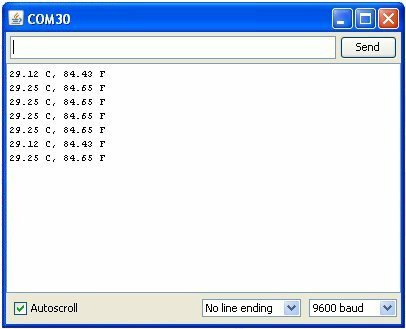 1) Use the EEPROM on Basic I/O shield to memorize tuned Radio stations. 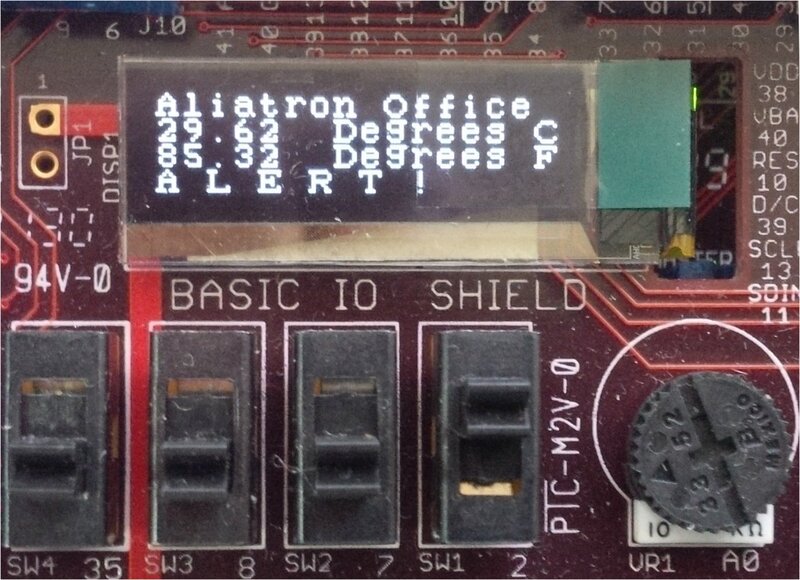 Memorization can be done remotely on pressing a button on the Front Panel, or a physical button on Basic I/O shield. 3) Make a stand-alone application of the Front Panel Project that runs on systems without ProfiLab-Expert 4.0 making use of integrated compiler that can create executable autonomous files. 4) Run the Front Panel from the Web making use of PL Webserver that can be supplied together with ProfiLab-Expert 4.0. The web page can be password protected so your application will not be run by unauthorized persons. 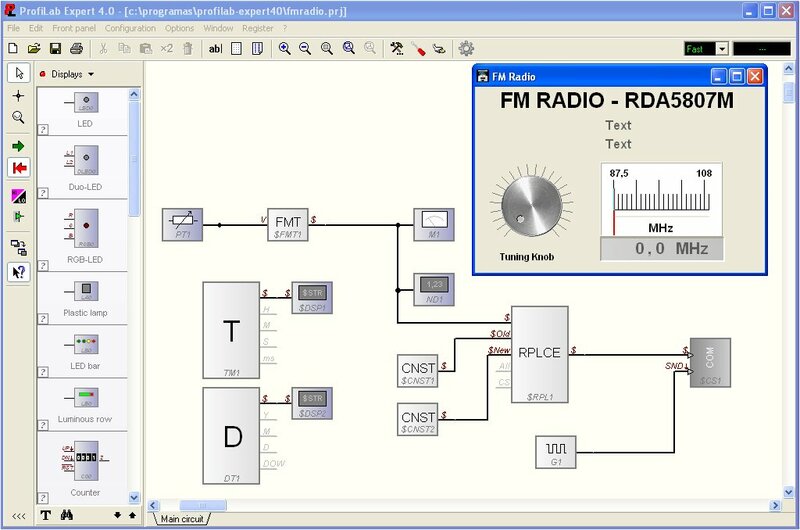 The RDA5807M – an equivalent of Philips TEA5767 and pin-to-pin compatible – is a single-chip broadcast FM stereo radio tuner with fully integrated synthesizer, IF selectivity and MPX decoder. The tuner uses the CMOS process, support multi-interface and require the least external component. It is completely adjustment-free. The RDA5807M has a powerful low-IF digital audio processor, this make it have optimum sound quality with varying reception conditions. 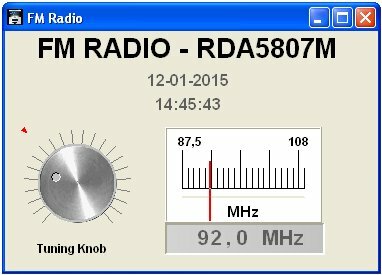 The RDA5807M can be tuned to the worldwide frequency band. The Digilent chipKIT uC32 and Basic I/O shield communicating in I²C protocol with the RDA5807M module can be quite a powerful, yet simple, FM Radio tuner. I²C uses only two bidirectional open-drain lines, Serial Data Line (SDA) and Serial Clock Line (SCL), pulled up with resistors. Typical voltages used are +5 V or +3.3 V although systems with other voltages are permitted. Now we are ready to upload the firmware. If all is well you can now tune FM Radio stations. The pot on Basic I/O is to be used to tune in the radio stations. You can add more features like a LED switching on when a station is tuned in. If the station is STEREO or MONO broadcast show it on OLED dspaly, and many other options that RDA5807M module allows. RDA5807M is superior to Philips TEA5767, and has many other possibilities and features. The Digilent chipKIT uC32 and Basic I/O shield communicating in I²C protocol with the RDA5807M module can be quite a powerful, yet simple, FM Radio tuner. What we have done effectively is a proof-of-concept, i.e. 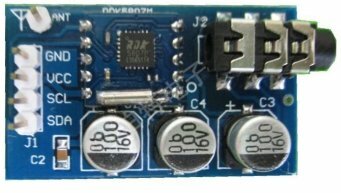 that Digilent chipKIT uC32 can be an adequate replacement to Arduino Uno board to work as a tuner of FM Radio.